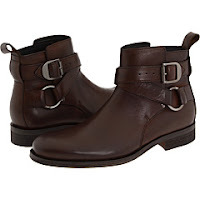 Kenneth Cole’s ankle boots with adjustable harness straps are a hit this Winter. Mind over Time boots can be worn with a pair of blue jeans and a dark blue or black velvet jacket to a classy - casual event. The New York style boots are made of leather, including outsole. They also come in two colors: brown and black and are metrosexuals’ favorite boots at this very moment.